KSC has your carpet stretching needs covered with quality Crain and Roberts Carpet Stretchers, Carpet Stretcher Tubes, and Stretcher Carrying Case. Gundlach Strecher Hooks also available that let you stretch off the wood subfloor making carpet stretching possible in unsupported areas like opposite windows or in mobile homes. Pin depth adjusting knob on the driving head allows for variable pin depth settings without the screws or screwdrivers found on other stretchers. Built-in push-button locking pin locks the swivel head in 5 different convenient positions including straight for square stretching, 15 degrees for most angle stretching, and 30 degrees for extreme angles like "L" shaped rooms. Pin depth adjustment bar enables variable pin depth penetration for diverse carpet thicknesses. Adjusts with 2 screws in the pin plate. #516 Stretcher Tube has a closed length of 2''10-1/2" and a useful length adjustment range of 3'' to 4''8". Approximate weight: 3-1/4" lbs. #517 Stretcher Tube has a closed length of 5'' and a useful length adjustment range of 5'' to 8''8". Approximate weight: 6 lbs. 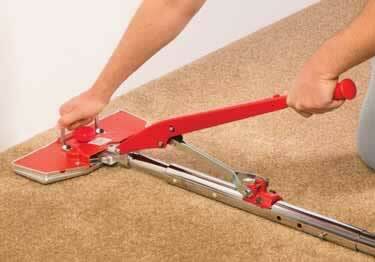 Also fits most standard carpet stretchers.